Ranil’s new alliance within next two weeks! 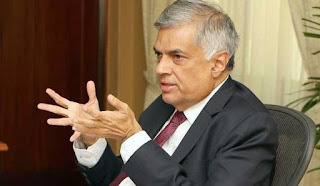 The new political alliance Prajathanthravadhi Eksath Jathika Peramuna (National Democratic Front) will be formed within the next two weeks, Prime Minister Ranil Wickremesinghe said yesterday. He said this new force would be formed together with the UNP and all parties who respects democracy. The Prime Minister noted that the primary aim of this broad political alliance is to develop the country. The Prime Minister made these comments during the opening ceremony of the Siyapath Sevana Housing Scheme comprising 266 housing units at Dematagoda at which he was the Chief Guest.